This page tells the story of how a quiet-spoken, cautious American Buyer for the rapidly expanding British Woolworth's, helped Allan Lane to launch Penguin Books. E. Clifford Prescott had been won over not by the young entrepreneur's salesmanship, but by his wife's insistence that he close the deal so that he could take her to lunch. Today Penguin Books is a world-famous brand - the gold standard in paperback publishing. But in a tale stranger than fiction, here we tell the story of how Mrs E. Clifford Prescott's love of Agatha Christie's Hercule Poirot helped to set the brand on the road to success, with a little help from her husband, the Fancy Goods Buyer at Woolworth's. F. W. Woolworth first stocked books in 1895, after the Founder bought bin-end 'job novels' to test as a 10¢ line in-store. They were well received, flying off the shelves in record quantities as the offer took hold. This established the Book Counter as an important part of the range. 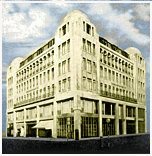 When the Dimestore Magnate launched his first overseas venture in Liverpool, England in November 1909, books were given pride of place. Again publishers' surplus stocks had been secured, consisting mainly of pocket-sized versions of short novels with perfect-bound hard covers. Today paperback books are everywhere. Sales far exceed the hard cover equivalents, thanks to their pocket size and lower price. It's hard to imagine that soft covers only became respectable in the mid 1930s, thanks to the vision of 33 year-old Allan Lane. 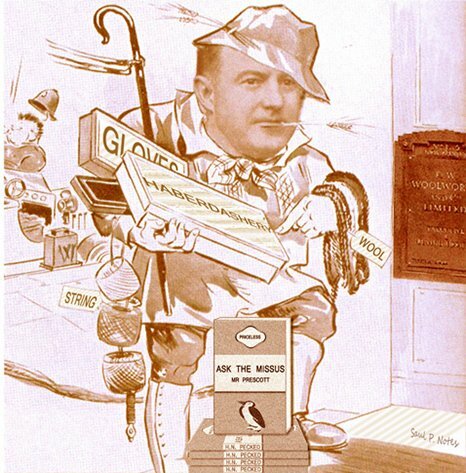 The entrepreneur evangelised the idea that station bookstalls and general stores could sell lots of good books for sixpence (2½p then, around £2.11 today), which was the price of a packet of cigarettes at the time. Shortly after founding Penguin Books, Woolworth's 'nothing over sixpence' motto drew him to approach the Buyer. Allan had learnt his craft at the publishing company of his uncle, John Lane. He had joined 'The Bodley Head' at the age of seventeen, and had quickly risen to become its Managing Editor. Some of his progressive ideas proved controversial in the Board Room. His fellow Directors were cautious and conservative. They had already fought his decision to publish the James Joyce novel Ulysses , which they feared could lead to prosecution. He had been unable to convince them to sign up to his plan to publish softcover books and sell them for sixpence. In 1935 he despaired, opting to resign and go it alone, after they granted him a licence to produce imprints of older titles from their back catalogue. The Penguin Company launched in July, operating from the crypt of a church in St Marylebone, London. The Bodley Head imprints had been supplemented with a few titles which Lane had bought outright from other publishers. Considerable thought had gone into the design of the new marque. The books sported distinctive, plain covers lettered in the modern Gill Sans typeface, and adorned with a cartoon penguin motif, which had been drawn by his twenty-one year old office clerk, Edward Young. Early sales were disappointing. Lane admitted to friends that the idea might fail, but then had a brainwave. If he could persuade F.W. Woolworth to carry even one of his books in each of their network of six hundred branches, he would be onto a winner. An endorsement from the retailer would certainly open doors elsewhere. The entrepreneur made his way to New Bond Street House in London's Mayfair. Woolworth had a policy that its Buyers welcomed callers to its Buying Ofices. They would always give an audience to anyone prepared to wait. Fifty-five minutes after entering, Lane was greeted by Clifford Prescott, a quiet-spoken American, the Fancy Goods Buyer, who explained that books were in his remit. He offered Lane fifteen minutes to make his pitch, and took him along a smart oak-panelled corridor and up the stairs to his private office. Lane's carefully crafted sales pitch seemed to fall on deaf ears as his host gazed out of the window at shoppers entering the Burlington Arcade. It seemed that books were not 'fancy' enough to catch his interest. The Buyer murmured that bin-ends of cheap job novels already had high margins, and people liked their brightly coloured hard covers. Moreover his popular Kiddies' Colouring Books had been staple-bound into picture card for several years. The diatribe was interrupted when his wife poked her head around the door. He apologised, explaining that she was on a rare shopping trip into town and had been promised a fancy lunch in Regent Street. Meanwhile Mrs Prescott spotted the Agatha Christie Poirot Book The Peculiar Affair at Styles among the assortment spread across the desk. She enquired whether Cliffy was going to stock them, observing that she would buy several a week from the sixpenny range. Whether the Buyer respected his wife's opinion or was simply hungry, he quickly changed his position. He signed an order for 36,000 assorted titles, exceeding Lane's wildest dreams. His secretary would provide a list of store names and addresses. Each of the six hundred would accept a crate of 500 books, sent out by train from the retailer's Granary Warehouse at the St Pancras Goods Station, which was only a short hop from St Marylebone. Two extra crates should be sent to the outlets in the major seaside resorts of Eastbourne, Bournemouth, Southend-on-Sea, Margate, Blackpool and Skegness, which were the top-performers. Lane was only too pleased to oblige. By the end of the summer season top-up orders from the branches boosted the total sale to 63,000 books, helping to secure Penguin's finances and to lay foundations for the future in more suitable premises in Harmondsworth, Middlesex, which would later stand adjacent to London's Heathrow Airport. Over the four years that followed Woolworth established a leading market share for the books. As Mrs Prescott had predicted Agatha Christie's Poirot and Marple stories were among the best sellers, but even these were outsold by the shoppers' favourites, sixpenny romances, in which the girl always got her guy! 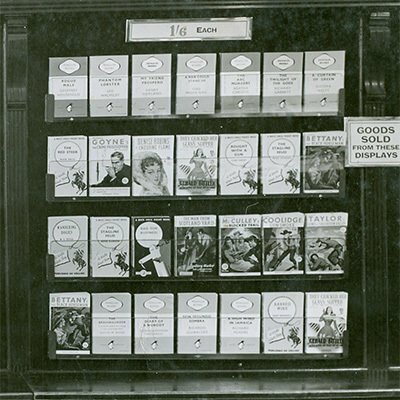 Sadly after World War II, with a new Fancy Goods Buyer in post who was keen to boost sales with more expensive items, the book displays were given less prominence in-store, allowing rivals like W. H. Smith to catch up and then overtake Woolworth's dominant share of sales. By 1950 Penguin had established an extensive and diverse catalogue and was on the way to becoming the world's best loved publisher. Woolworth had played its part in opening the door, before stepping back into the shadows as one of many thousands of stockists selling a few books per store per day for the next fifty-eight years. It is said that, even after retiring to the USA, Mrs Prescott received a handwritten card each year from Allan Lane, saying "Merry Christmas and thank-you".